I joined the Civil Service in July 2017 with the mission of building up a data architecture function for the Office for National Statistics (ONS). With the ONS being a data-driven organisation, data architecture has been going on in various forms for many years, but this is the first time that it has formally been recognised as a function and a division has been set up to create, implement, maintain and govern an office-wide set of data structures and standards. Soon, I realised that it is not only the ONS which is starting the data architecture journey, but that many other departments within government are in a similar situation and have started similar efforts to take full advantage of their data states. In the light of this, the ONS hosted the first cross-government data architecture workshop in October 2017, with the intention to align these journeys as much as possible, and in February 2018, the second workshop reinforced the need to look at specific areas and to create a community of government data practitioners to see progress through. But why is the ONS in particular interested in fostering a cross-government data architecture community? The ONS’s main mission is to create high-quality statistics to inform the public and help decision making. While this has traditionally been done by using surveys, advances in data analytics and policy have allowed the ONS to use administrative data produced by other organisations, particularly other government departments. We call this ‘administrative’ (or admin) data. While architecting ONS survey data is relatively straightforward, admin data has been collected with different standards to those of the ONS. It therefore seems reasonable that the ONS should join with its government partners in the process of developing a common understanding of their data states, and during this collaboration, foster the creation of common data principles and standards. This approach should benefit all sides, not only because any sharing of data will be more efficient, but also because by sharing knowledge and using a common language, the journey of developing a data strategy for every organisation will be made faster and easier. Together with the cross-government workshops, the data architecture community is establishing a number of communication channels to both collaborate and inform. This blog is aimed at, and written by, data architects working in departments across government, but should also serve to inform the general public about what data architecture is and what government is doing to join efforts in its development. It will also allow us to share our common challenges and lessons learned in the field of government data architecture. If you work for government and are interested to join up, or if you have any questions about what we are trying to do, you can contact us at data.architecture@ons.gov.uk. What do data architects do? One question - does the data architecture practice/function at the ONS cover some/all of the wider data management functions (e.g. as in the DMBoK) or they distributed througout the organsation? We're familiar with DAMA but not strict subscribers to the DMBoK. Within ONS we follow frameworks such as (but not limited to) CSDA, GSIM, GSBPM, CSPA. These frameworks may incorporate elements from DMBoK. 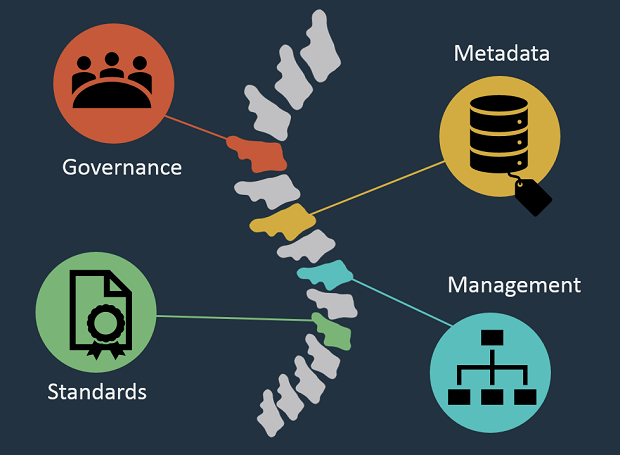 The challenge faced by the new data architecture function will be to document and centrally manage the existing practices whilst filling in the gaps as necessary. What are some of the steps you choose to set up a Data Architecture function ? We'd be happy to provide some insights into our experiences of developing a Data Architecture function. What would you like us to cover specifically? Would it be helpful to know how we identified a need for the function, or what physical steps we took to set up the function?